My son's 7th birthday was last week. I know- crazy! I did some writing earlier this week and had to change my bio to say "mom of a 7 yr. old boy". Time certainly does progress on. But to celebrate the occasion we had booked a party at the local Skyzone. Which is a fabulous trampoline park not far from where we live. They have party packages where you get the invites, jump time, pizza and pop. I really felt a bit lame sending the invites out- completely not creative. But time is short so I went with it. But as the day approached I felt more and more bothered by the complete lack of creativity that I was expending this year. Last year, if you remember, we did an Explorer party at the local nature center. I made explorer notebooks for each kid, explorer packs, the invites were in an itinerary format, and they got to touch a snake. I mean how cool is that? So I panicked. I decided a day and a half before his birthday to pull together a ninja theme. Yup. It actually turned out pretty cute. I googled ninja parties, got some cute ideas for making ninja masks out of t-shirts, made a ninja stamp from a drawing Jasper did of a ninja for me, and found some cute little ninja guys at the local party store. It was coming together.... when my son informed me that the chocolate dipped strawberries we had planned on bringing for a snack to school weren't cool enough. He wanted cake pops. Now, far from me to discourage the use of cake pops in any situation. BUT, I already had cupcakes to make for the party, treat bags to finish up, ninja masks to figure out, and decorations to plan. For a little extra ninja fun- his lunch was ambushed too. Yup- ninja sunbutter and jelly sandwiches. Love those candy eyes. The idea was that the kids would show up to the party and I'd tell them that to earn their ninja masks, they had to do ninja training on the tramps. Cool idea, right? Yeah- they're 6 &7 year old boys. They played dodgeball the whole time and had a blast. So much for the theme, but it was still the "best birthday party ever!". So I guess I'm satisfied. What Products to Create with Women in Need Would You Recommend? I just erased everything I just spent the last 10 min. writing. It was all about balance, how to do it (still don't know), how to channel my time (horrible at it), and how to make the most of my day (getting better). Now that that is out of the way I want to ask you some questions. I have been blessed with the opportunity to do some product design for a mission team that's traveling soon. They are going to be working with some women in a South American country to hand make items to sell here in the U.S. Now the problem the team has is that what these women have made in the past doesn't sell as well to the US market as they'd like. So they brought me in to help them brainstorm products that these women can make. The women are excellent stitchers. They have the patience and skill to execute fairly intricate work. They are willing to do production work. They sound like they have an awesome attitude and really want to make sell-able goods. Their color choices in the past seem a little too bright over here. They don't have easy access to mail or shipping. They don't have easy access or the money to purchase high end supplies. The volunteers have to be trained to teach the women the product construction. The goal is to have them make a product or number of products that can be sold both online through a Christian gift company and can be wholesaled to the non profit gift boutiques that we have here. The price points would be under $50. NOW, what gift item that can be stitched by hand would you purchase? 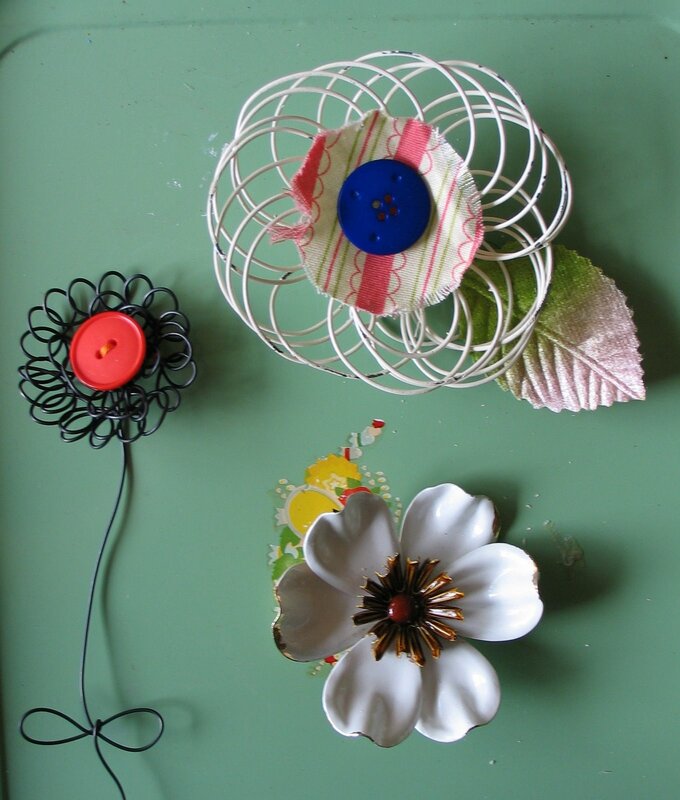 I gave them free access to any of my designs, like the wire flowers, wire words, mini art quilts etc. But heavy wire isn't practical for the mission team to carry in with them. So I'm brainstorming. What would you buy? Small quilts? tea or coffee cozies? fabric jewelry? embroidered tea towels? What about nicely done place mats? or hair accessories? What sort of thing would you buy for your friends' birthdays? And what color combinations appeal to you most? I'd love to know what you all think! It would really really really be a blessing right now to know your opinions!